All throughout October, I’ve been reviewing some of the most iconic and influential horror movies of the 1990’s. 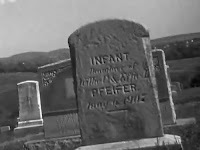 Some of the early thrillers like “Misery” and “Silence of the Lambs” took the horror away from all the gimmicks previously established by horror filmmakers throughout the 70’s and 80’s like Wes Craven and John Carpenter. Thus, the horror genera was making mainstream success again. In my last review of the 1996 movie “Scream”, I obviously credited Wes Craven for adding a distinct twist to the slasher genera, but even with that said, it still wasn’t a land mark movie achievement. 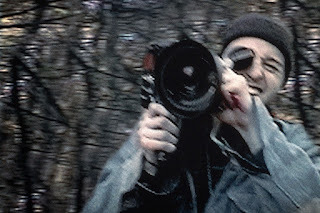 The first truly innovative horror film of the 90’s, and arguably the most popular event for the genera sense the 1978 classic “Halloween”, was a little mock-doc in 1999 titled “The Blair Witch Project”. 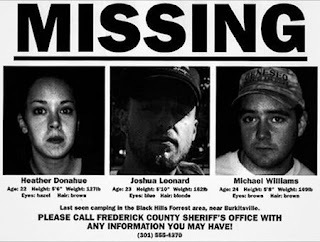 Set in 1994, the mysterious legend of the Blair Witch attracted three young filmmakers to a small town in Maryland to shoot a documentary. The travelers venture into the woods where the supposed spirits dwell ... and none of them were ever seen again. 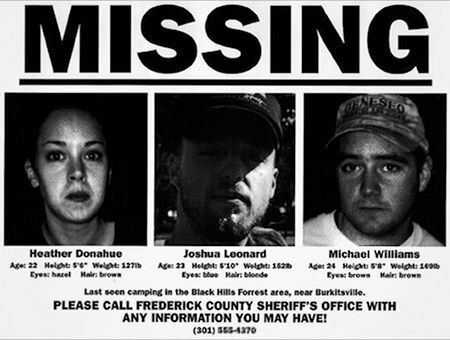 Years later, the remaining pieces of the documentary project have been put together from the film and videotapes found scattered throughout the forest in which they disappeared. Does the existing film offer any real evidence of a supernatural presence, or does it even explain what happened to the three young filmmakers? That’s the movies gimmick, whether or not any of this really happened. 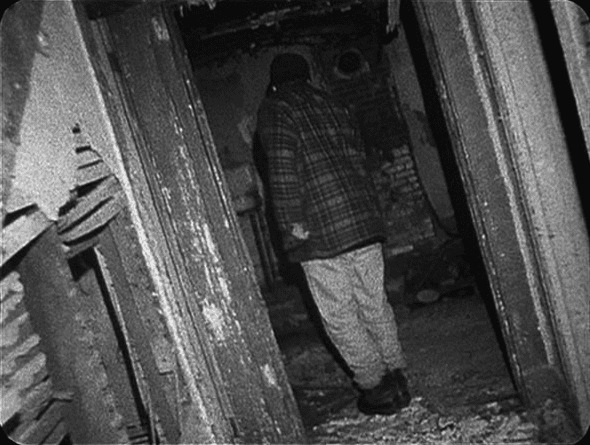 Admittedly the concept of found footage horror has been done to death, especially with the mainstream success of “The Paranormal Activity” franchise, but for the time, this was still a very clever concept to full the audience in believing that what their watching is real. 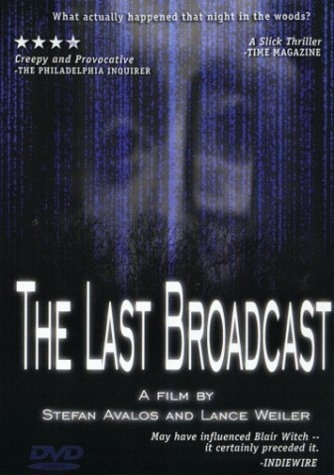 To be clear, “The Blair Witch Project” wasn’t the first film to utilize this concept, in fact there was a movie released a year earlier titled “The Last Broadcast”, which utilized the same formula. 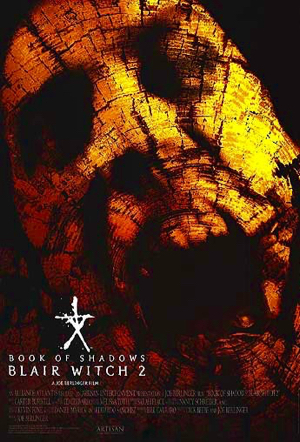 Of course there was also a sequel in 2000 titled “Book of Shadows: Blair Witch 2”, but I have no interest in seeing it, plus it’s gained a reputation as one of the worst movie sequels of all time so why bother. In 2016 there was a reboot of sorts simply titled “Blair Witch”, and from what I’ve heard it was a half way decent sequel/reboot, just not as good as the original. 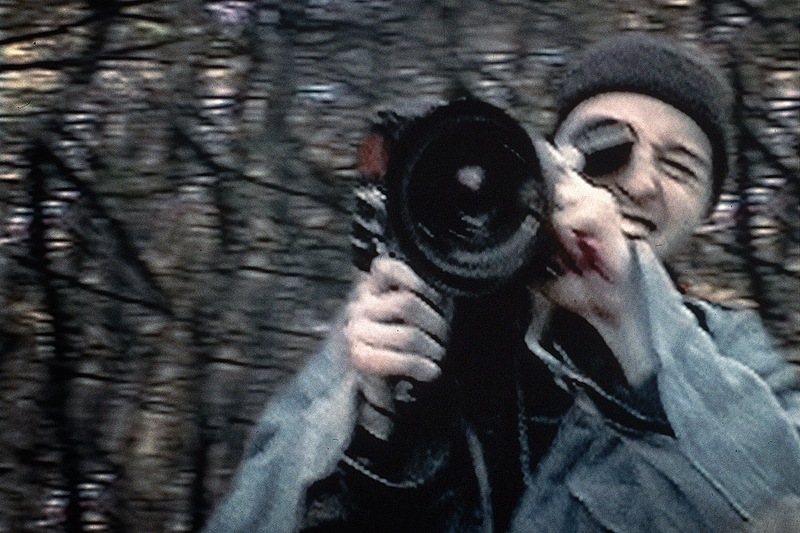 Even though this movie wasn't the first of the found footage horror movies, “The Blair Witch Project” is the one that became a house hold name for horror fans of the 90’s, and has sense been called a staple of the genera. I personally didn’t see this film when it premiered, and had sense become sick to death of the whole found footage genera all together. 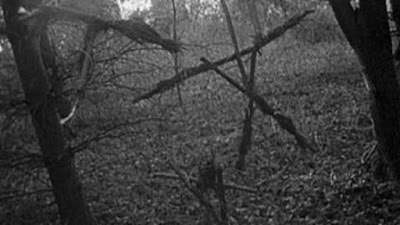 But when I finally watched “The Blair Witch Project”, I noticed that it actually has two aces up its sleeve, which still allow the film to hold up after all these years. One is that despite the “real or not” gimmick, it still simulates a genuinely creepy experience where you feel like you’re in the shoes of the missing filmmakers. None of “The Paranormal Activity” movies ever captured that same simulating feel, at least not for me. The second and personally I think the most important thing that “The Blair Witch Project” got right is the setting. Even without the supernatural elements, being alone and lost in the woods is already a very terrifying concept which is captured very well here. The forest itself feels like a labyrinth that is contently changing, and it puts you in a state of paranoia where you just want to get out of it. There’s a very effective moment in which we see these young filmmakers walk over 15 hours in a single day, only to find themselves at the exact same place they started that morning. The forest setting also creates a foreboding atmosphere where anything can happen, and something mysterious might be out there watching you. I also like that this film set up a small community mythos surrounding the supernatural elements. We see interviews with people early on, who supposedly had supernatural encounters, and it peeks your interest to explore this forest yourself. It’s also a nice touch that the film takes place during October, that way we can see some amusing old school Halloween decorations. 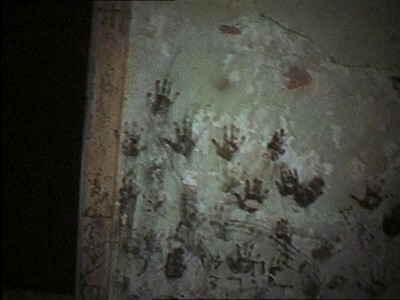 While nothing supernatural ever happens, we get little details of strange oddities like the bloody hand prints of children on a barren wall, branches all woven together to form voodoo dolls, and piles of stones randomly lying around. These little touches give you the impression of something malevolent in the woods, and it starts to raise questions. Of course it’s the night time tent scenes that capture all the old school camp-fire scares perfectly, including eerie sounds, and the power of one’s imagination filling the dark void for what might be out there. 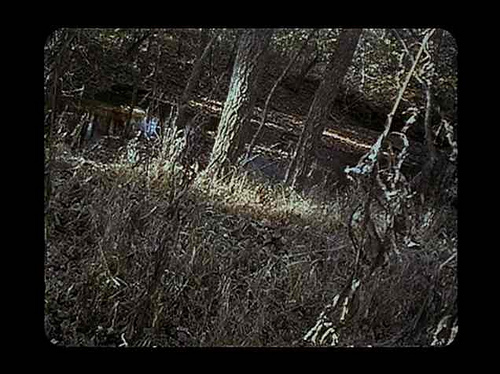 On a side note, I like the crappy quality of the camera, making it feel like real found footage. Now I’m not going to lie, the first 30 minutes or so of this movie are really hard to sit through. This film gets off to a boring start, and obviously we need to set things up, but these three teenagers are very annoying, and hard to put up with. Their dialogue, while very natural is also very repetitive, and it gets grading to hear them make the same statements over and over again. Once the crew gets very lost in the woods, I slowly found myself more and more invested in their situation. Now while the characters are mostly interchangeable I do want to give some serious credit to actress Heather Donahue, who’s performance is outstanding. When she got scared I believed it 100%. She felt very genuine, natural and full of nervous energy. Of course the most famous scene of the film is when Heather Donahue has her big break down and confesses her fear that nobody will survive. It’s downright unbearable to watch, and the longer the camera holds on her face, the more I want to grab a tissue and wipe that runny nose of hers. I really wish the film would have just ended right there, that would have been the perfect clench. Unfortunately, we get this forced climax where the last two members of the group find themselves in an old abandoned house. They run around the different floors, we see those creepy hand prints on the walls, the camera falls over, and then the movie abruptly ends, which has got to be one of the most anti climactic finals I’ve ever seen. It’s as if the movie didn’t know how to end, so it just pulled the plug on itself, which is far more annoying then scary. So how does this film really hold up after all these years? Well, I usually prefer seeing things on screen, but I can’t deny the power of keeping the scary material off-screen. 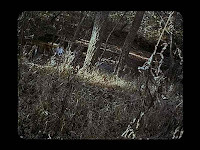 In this film there are no monsters jumping out of the dark or knife-wielding maniacs with a grudge against teenagers. Instead, there is a relentless, slow build of mystery and paranoia which the viewer must endure alongside the travelers, as we’re forced to see it all unfold through their eyes. But even with that said, I’ve still seen other horror films that I felt were far more effective at scaring me with nothing on screen. Both the 1942 classic “Cat People” and the 2002 thriller “The Others” had the same understanding of “less is more”, but I also felt that I got more complete movies from them, with interesting themes and subtext. “The Blair Witch Project”, while effective at times is still just a simulation, where you tune in, get scared, but nothing really sticks with me either. Also, even though this movie was a big event for its time, it’s not something that holds up for repeated viewings. 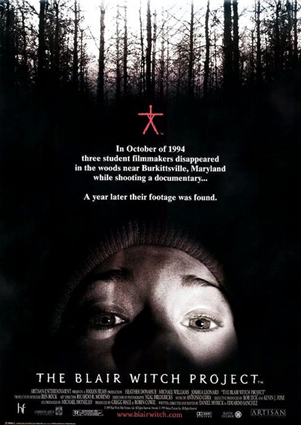 I’ll give “The Blair Witch Project” this much credit, it had a great setting, an effective lead performance, and of all the found footage movies I’ve seen ... this one is probably my favorite, but that really isn’t saying too much either. 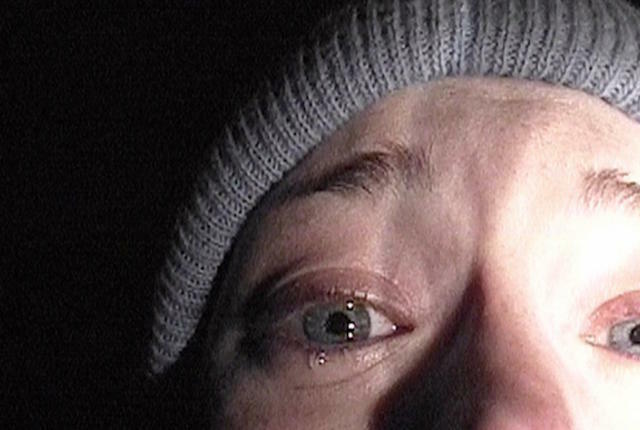 I give “The Blair Witch Project” 2 ½ stars out of 5. Did you know you can create short links with Shortest and earn money from every click on your shortened links.